After a tricky start as Leeds United boss Steve Evans has gone into the latest international break in better spirits following back to back victories for the club for the first time since March. Evans and his coaching staff are now looking forward to having the chance to work with the players on the training ground without the pressure of a league game just round the corner and will be working hard to get their football philosophies across. Already it is clear they are somewhat different to previous head coach Uwe Rosler with the Whites noticeably playing the ball longer and quicker and two strikers employed from start to finish in games. Results have been mixed with two wins, two draws and a defeat so far, but with just one loss – albeit a bad one at home to Blackburn – it has to be admitted that there has been an improvement on the way things were going before Rosler’s exit. Evans believes there is still room for more improvement despite a 3-0 victory at Huddersfield last Saturday and a 1-0 success against Cardiff that ended the bad home run in midweek, but he can now sleep easier after the victories and clean sheets. 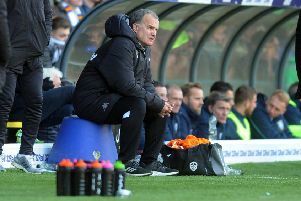 He may even be able to start dreaming of staying in the job longer than his immediate predecessors and has been brave enough to talk about the lack of longevity in being Leeds boss these days – even cracking a joke. “I’m being told from above that I’ll be here for a long period,” he said after Saturday’s game. “I keep telling everyone my contract’s to Friday. Which Friday, I don’t know. “I wouldn’t have been the choice when I first came in,but Yorkshire people are very similar to Glasgow people. A spade’s a spade with them. It’s not a shovel. Evans knows only too well that football is a results business and if he does not get United up the Sky Bet Championship table he will be the next to suffer the Cellino axe. He said: “The one thing that’s common here is there is good players at this football club – and they’ve underachieved, and that’s why Uwe had to go. Evans has not yet added to his squad, but wants to before the current loan window closes. Surprisingly it is a midfielder who looks like being the first in despite Leeds having plenty of players in that department who are already not getting a regular game. Evans came close to signing Liam Bridcutt from Sunderland last week in time for the Cardiff game, but the deal did not happen and with other clubs interested it remains in the balance. If a deal can be agreed he may be in the Leeds side that plays in a friendly arranged against Wycombe Wanderers on Friday evening. Evans has arranged the friendly to keep things ticking over and it will give him a chance to have a look at some of the fringe players he has not yet got into the first team. He said: “It’s a game I know both sides will be taking very serious. “The supporters can expect to see the usual faces – aside from those away on international duty – but there is also the opportunity for certain players to force their way into our plans between now and then.